I’ve been busy lately, attempting to shoot butterflies as they emerge from their pupal casing and I`m finding it a huge learning process. I thought I ought to write a post to share some of the tips I`ve been picking up on the job. So here are 7 tips that anyone should consider before setting out to shoot emergent butterfly and pupae. 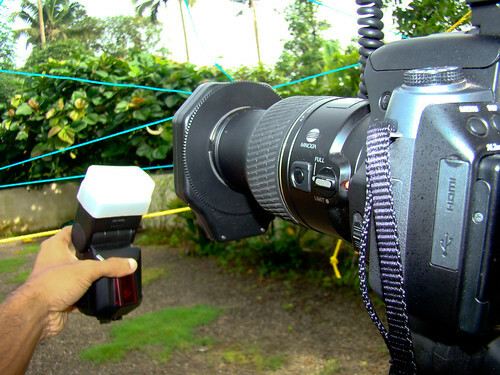 The right equipment can make the difference between an average image and good images. One may need to choose specialized equipment. A true macro lens is preferred in such situations, which helps to focus closer, focus sharper and fill the screen with the subject. 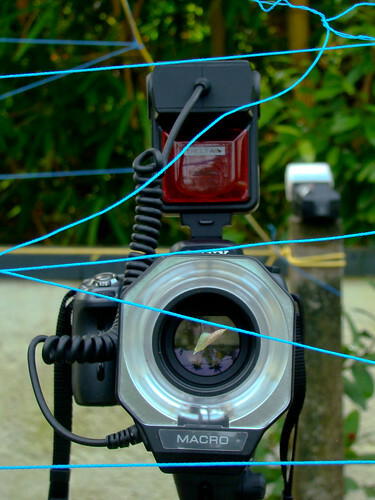 Lighting can make all the difference and one has to pick carefully between using a ring light, on board camera flash or off camera wireless flashes. Each choice can help to light the pupa differently and highlight different areas of the pupa and the emerging butterfly. 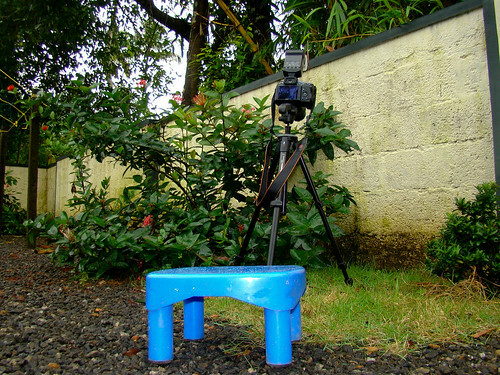 You may have excellent stability in your camera grip and stance, but it will never compensate for the use of a tripod. Macro lenses have very thin depth of focus and fixing the camera in one location will enable precise control over the focal plane. 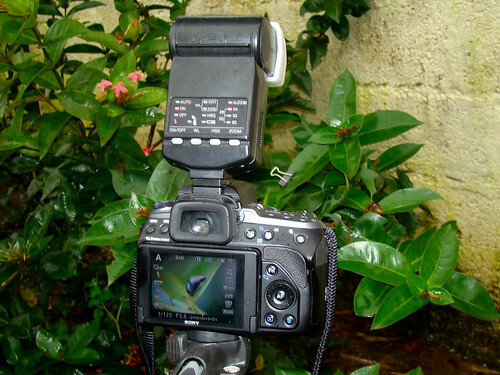 One may also need to play around with different aperture settings to precisely control depth of focus and exposure. 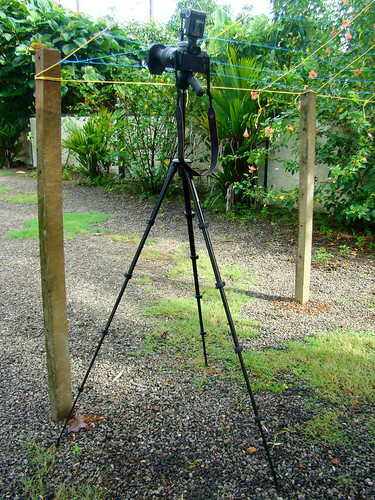 The ability to leave the camera on a tripod also relieves the photographer of having to lug around and prop up its weight, which can make a drastic difference when shooting for long hours. 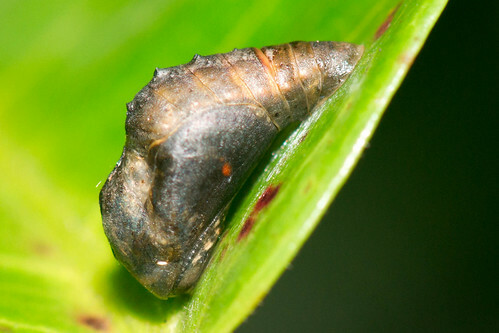 When shooting a pupa in its natural habitat its location is more than likely to be in a hard to shoot area. 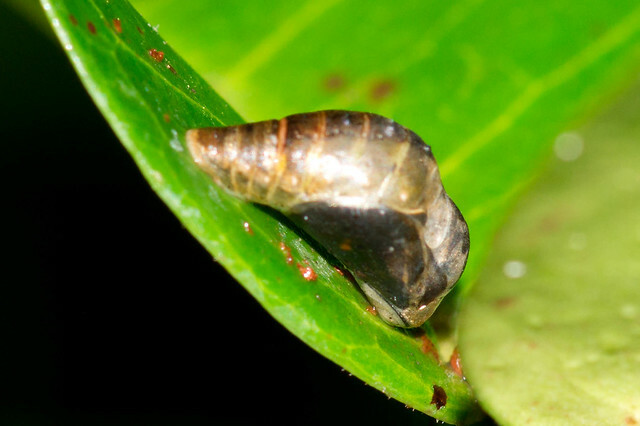 The pupation is likely to occur in a concealed area, such as under a leaf or amidst a clump of branches, in order to afford it maximal protection from predators. To get over such obstacles, one can “prepare the scene” before the action occurs. 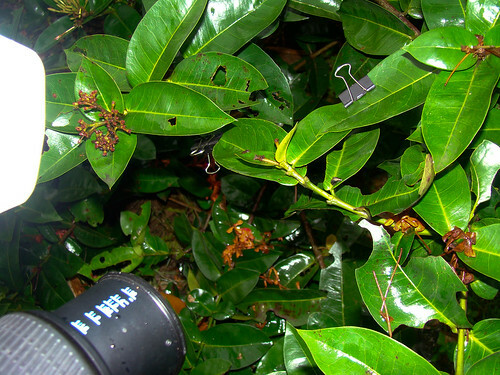 I usually use a few paper clips to manoeuvre branches and fix them in a way that exposes the pupa and reveals it in a pleasing foreground for the camera. 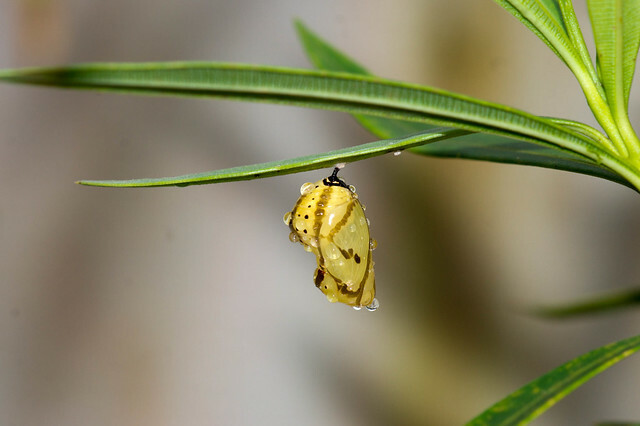 Be careful while doing this as a pupa can be delicate and easily dislodged/damaged. Knowing the details about your subject can make all the difference between a long wait, a successful shoot or a near miss. 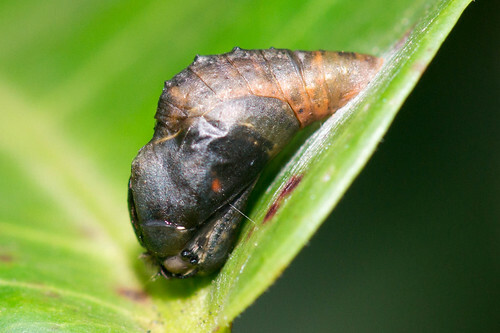 Most pupa will change its colour the day or hours before pupation. 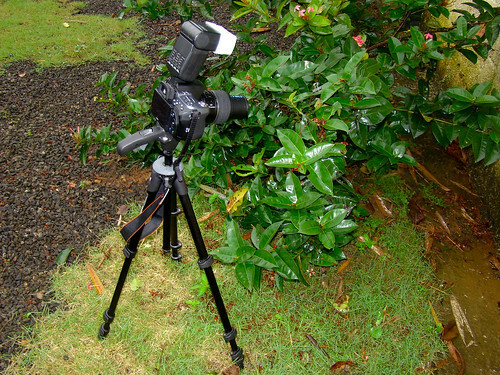 Knowing this enables the photographer to prepare and set up his gear in time to catch the event. 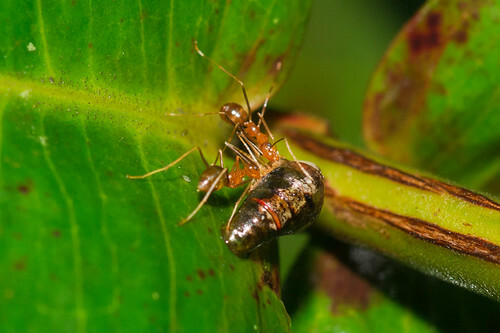 Similarly, knowing the physiology and structural biology of the insect helps the photographer to pick out important stages or body features to watch for and focus on. 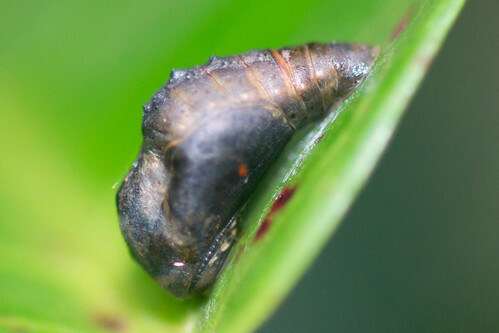 The first time I shot a pupation, I spent more than 22 hrs waiting for things to happen. 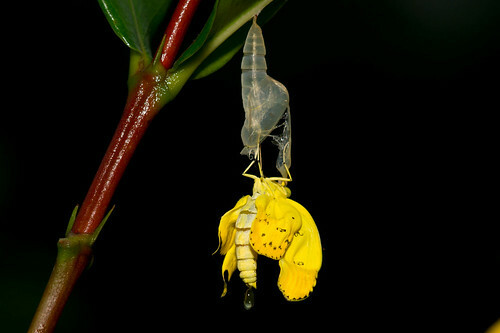 The caterpillar or pupa may spend hours not moving before suddenly undergoing a drastic metamorphosis. Thus there may be a lot of waiting and watching involved and it pays to make yourself comfortable while at it. Get a chair or a stool and have a seat, or bring along your mp3 player or mobile device to listen to music/ surf while you wait. However, don't forget to keep observing, the first signs of hatching/pupation are given away by a few wriggles/quivering movements. The weather can often play spoilsport. Taking refuge during the rain can mean missing out on the crucial moment. Make sure you have enough weather protection. 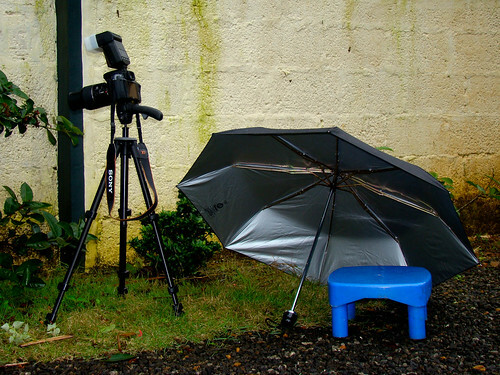 Rain coats, umbrellas and camera guards can help you stay at the location during light rain. If it is a must-catch scenario, then building a canopy over the location would not be out of place! When shooting natural specimens, be ready for disappointments. The unexpected is always likely to occur. While trying to shoot the emergence of a Monkey Puzzle butterfly, I spent three days without success with three separate pupa. With the first one, I spent 3 hours monitoring it and then decided to take a break. When I returned, the butterfly had already emerged and flown. 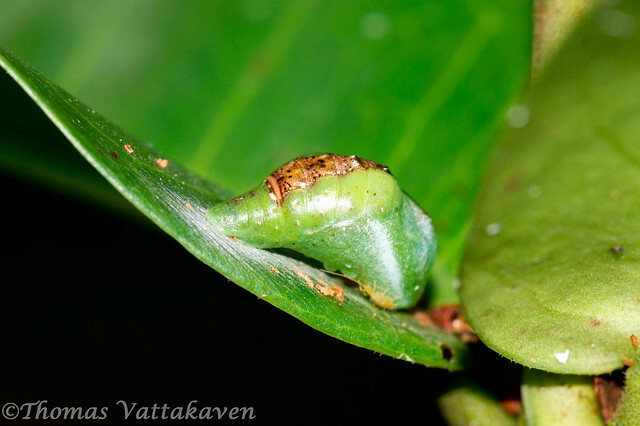 The second pupa was eaten by ants from one side while I monitored the other side (see pic above)!! With the third one, everything seemed to be going fine, the pupa finally quivered, and pushed its casing open, repeated the pushing motion a few times and then died (see pic below)! I`m yet to capture the emergence! The best nature photographers are those who put a lot of effort and dedication into their work. You also need to be lucky and knowledgeable at the same time. However, nothing compensates for preparation. 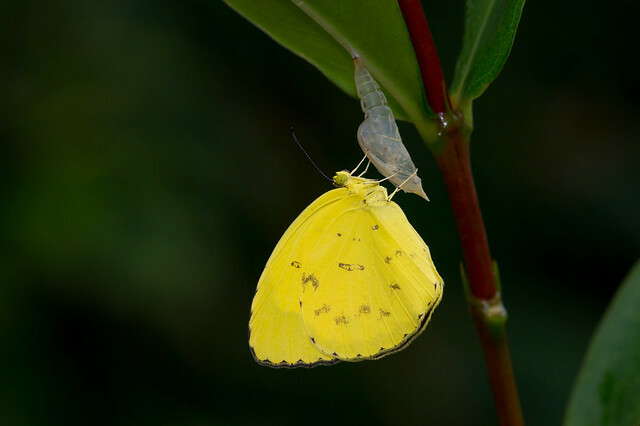 Hopefully some of the above tips will help you to understand and prepare better for capturing that magical moment of a pupa’s emergence.